Bed occupancy has risen in recent years, and a majority of trusts were above 92 per cent for at least half of last winter. This has consequences for clinical safety. As bed occupancy rises, the boundaries between different bed pools break down until eventually there is little distinction between surgical and medical beds, the infection control cordon around orthopaedics is breached, female surgery spills out into gynaecology, older teenagers are bedding out in paediatrics, and patients are sleeping overnight in the emergency department and the day surgery unit. When patients end up in the wrong beds, they have longer lengths of stay (which makes the bed occupancy problem worse), which in turn is associated with poorer care and higher cost – a vicious cycle. There is also evidence of increased mortality and higher emergency readmission rates. Acute hospitals take a pragmatic approach to deciding which beds should be used for each specialty. The financial planning process allocates budgets in some detail, and this translates into staff and therefore staffed beds. But nobody realistically expects every specialty to keep within its own detailed bed allocation all the time. That would require a very low bed occupancy which is simply unaffordable – see for instance the example occupancies in the bottom row of the figure below. 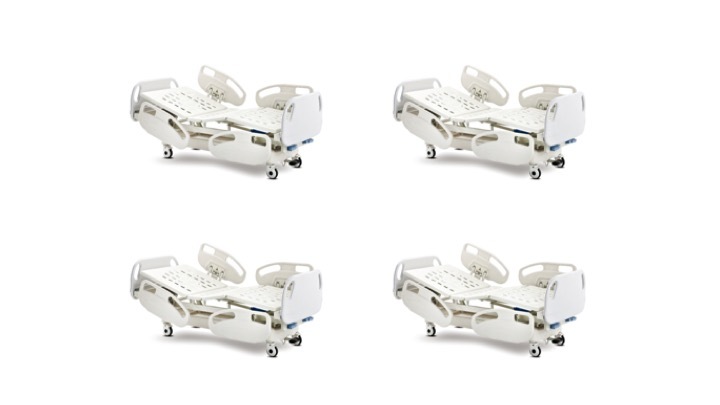 So specialty beds are usually combined into larger bed pools, such as medicine, surgery, orthopaedics, paediatrics, and maternity – some adult bed pools are shown in the middle layer below. By working flexibly within each bed pool, services can run at higher bed occupancy for the same overall risk of running out of beds. Smaller services such as maternity and critical care may form close relationships with neighbouring units and lower their risk that way. 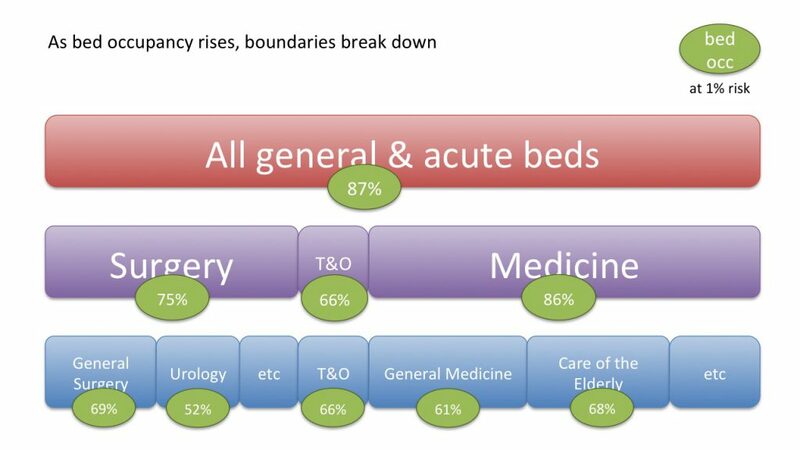 But if bed occupancy is too high even for these arrangements, then the boundaries break down and the hospital essentially becomes one giant bed pool with all the risks outlined above, as shown by the top layer below. What can be done to avoid this, if opening extra beds isn’t an option? We saw in the previous article how bed occupancy can be calculated for a chosen risk of running out of beds, and we can use the same method to work out whether morning and weekend discharges are likely to help. 1) the actual variation in bed usage during the week – we saw this chart in the previous article. 4) doing both, so that the average discharge rate matches the average admission rate every hour of the week. We can tell whether these interventions make much difference by looking at the horizontal grey lines marking (from the top down) the 1 per cent, 10 per cent, and 30 per cent risks of running out of beds. They narrow as discharges improve, but not dramatically. And when that intra-week risk is combined with the week-by-week variation to calculate the overall bed occupancy, the benefits of better discharge patterns turn out to be negligible, as shown in the table below. But (an operational manager might splutter at this point) surely morning discharges do help with 4 hour waits in the emergency department? Indeed they do, sometimes. We will see why, and when, in the next article. If better discharge patterns produce disappointing results, what about reducing lengths of stay (LoS)? The chart below shows a scenario in which any patient with a LoS over 21 days has their LoS somehow reduced by 20 per cent, or 10 per cent if it is over 7 days. This turns out to reduce the number of occupied beds by a whopping 11.5 per cent. Yes, it’s an arbitrary scenario. No, I haven’t shown how achievable it is in practice. But the point is that we aren’t scratching around for tenths of a percentage point any more – this is a huge difference. And it arises because the majority of these beds are occupied by those patients who have the longest lengths of stay. In this article we have only looked at one example, but similar conclusions have been reached with all the general and acute bed pools that we have so far looked at: reducing the longest lengths of stay, as opposed to increasing morning and weekend discharges, is where efforts should be focused. And of course this is also the conclusion that NHS England and NHS Improvement have come to in their own analysis.